Lighthouse Stamps – Chesapeake Chapter U.S.L.H.S. 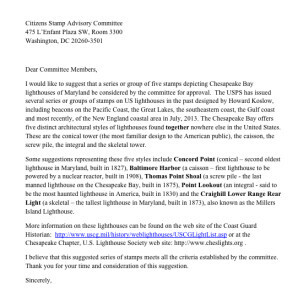 If you support the idea of the US Postal Service issuing a set of postage stamps that features five lighthouses from the Chesapeake Bay, then the Chesapeake Chapter, USLHS requests that you take one of the pre-printed letters with you. Please fill out your name, address and the date up top and sign at the bottom. Then place it in an envelope addressed to the Citizens Stamp Advisory Committee, which is on the top left of the letter, affix a stamp to the envelop and place it in the mail. We will accept the signed form letter from you to mail to the committee, but it has more of an impact on them if the letters are mailed to the Advisory Committee individually, instead of in bulk from our organization. THANK YOU FOR YOUR SUPPORT OF CHESAPEAKE BAY LIGHTHOUSES! Letter recommending an artist for the design of the stamps.